Monica Hinton, PhD has worked in Mental Health and Substance Abuse for over 20 years. She is a Behavioral Health Therapist at SHARP McDonald Center, which is a medically supervised substance abuse recovery program in San Diego County. Dr. Hinton has been the Program Director of Alpine Special Treatment, Inc., which is a 24-hour secured setting that offers supportive, rehabilitative services for people suffering from psychiatric and substance abuse disorders. Dr. Hinton has been the Chairperson of the Training and Implementation Committee for CADRE/CCISC for San Diego County. The San Diego Change Agents Developing Recovery Excellence (CADRE) is comprised of county staff and providers who are committed to the Comprehensive, Continuous, Integrated System of Care (CCISC) model of service delivery. This committee decides upon the training topics and the delivery of that training for clinicians working in behavior health programs throughout the San Diego County. 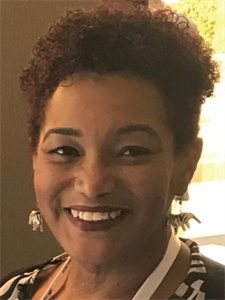 She is the President of The Black Psychologist Associations (ABPsi), San Diego Chapter, an international organization that actively addresses the behavioral health challenges of the African/Black diaspora. Dr. Hinton utilizes this platform to teach and advocate for more culturally appropriate treatment for people of color, especially African-Americans in San Diego County.